Gear that we won't leave home without. Photos: Martin Hackworth, JR Hackworth, KLIM, Leatt, Rekluse. A theme that is well-represented in email and Facebook questions that we field is what accessories we won't leave home without. Though most of these queries are from riders considering The Tour of Idaho, it's a great topic for general discussion with anyone pondering lengthy rides in remote and/or technical terrain. What follows are our richly-informed, yet highly subjective musings on this topic. While we feel that the time we spend around here on long rides in remote places more than qualifies us to address this issue, we do not feel that ours should be the last word. Opinions about accessories, like opinions about motorcycles themselves, are largely a matter of unique perspective and personal preference. A set of goggles, for instance, that fits one rider perfectly, may cause nothing but annoyance for someone else. So we'll issue our opinions with the following simple caveat: your mileage may vary. First up is a steering stabilizer. Yes, you need one. We've used just about every stabilizer/damper ever made, and like the Scotts better than nearly all the rest of them put together. The Scotts unit is a true stabilizer, not merely a damper, and is loaded with useful features that make it well worth the price that it commands. It's also extremely rugged (we are going on four years without a rebuild). The Scotts damper is nearly transparent in use, but you'll sure notice that it's not there if you ever take it off. Next is the Trackside 12 volt power adapter. This inexpensive power point comes with plenty of mounting options and is more durable that it might appear. Ours has provided trouble-free service for three full seasons. It's absolutely indispensable. We can't imagine what a drag it would be to ride dirt bikes without our KLIM ECE F4 helmets now that we've used them for a few seasons. Though the KLIM ECE certified F4 helmet is not DOT approved, it's nearly a pound lighter than the street-legal DOT/Snell approved model. That is a lot. As much as we liked the traditional F4, which is the most ventilated helmet available, the ECE tops it. The massive ventilation afforded by the multiple vents and plenums in the ECE F4 is amazing. The F4 flows rivers of cool air - even at a walking pace. When you sweat inside the ECE F4, it flows so much air that the sweat quickly evaporates and your head cools like it's air-conditioned. It's really your best friend in hot weather (and in cold weather, as well, with the snap-in liner). The ECE F4 is also very comfortable - which, along with light weight, lessens fatigue. KLIM feels that the ECE model offers all of the protection necessary for even very fast trail riding, and we agree. We are quite confident that the ECE F4 is one of the two or three best dirt bike helmets out there. It's much less expensive than the other players in it's corner of the market. For the past few years I have ridden exclusively in over-the-boot KLIM Dakar Pants (all of the MoJazz staff wears Dakars in either the itb or otb version). The Dakar Pant provides 90% of the ventilation of the flow-through KLIM Mojave Pant, and is practically as comfortable in the sun as long as you choose a light color for warm weather (like the light grey). The difference between the Dakars and more ventilated pants occurs when the vents are zipped shut. The Dakars provide a level of versatility in handling cold that other pants do not. Dakars are serious, utilitarian garments that will serve you well in a variety of circumstances. They are festooned with useful features, very comfortable, extremely durable, and easy to get on and off. We also ride exclusively with either the KLIM Dakar Pro or Mojave Pro jerseys. These command a premium price (over $100 in each case), especially for a jersey, but they are the heaviest, toughest jerseys we've ever worn. Yet for all of their heft, they are actually cooler in the heat of summer than some flow-through jerseys made by other manufacturers. Versatile too. Throw on a light, windproof jacket over a Dakar or Mojave pro and they act as an air-trapping layer to keep you warm. Once you get into either of these highly functional jerseys you'll never want anything else. Yes - they are that good. KLIM, at least in my view, is to be commended for bucking the trend toward inexpensive, price-buster products of poor quality. Can a $10 disposable jersey be too far in the future? Personally, I'll gladly pay more for a quality garment like the Dakar or Mojave Pro. The KLIM Adventure Glove is a high-end enduro glove made of leather. The Adventure glove is lightweight, water resistant, sturdy, protective, amazingly well-ventilated and stretches to conform to your hand in all the right places. It is also just about the nicest feeling glove out there. Even in black, my hands never get unduly hot, and the extra levels of protection and comfort make these the gloves to beat. They are also, no surprise, one of the most durable gloves around. For carrying gear, the KLIM Krew Pak is much better for technical riding than any sort of lightweight hiking/running backpack. The Krew is brimming with useful riding-specific features - like straps that are anatomically correct for riding and positioned to accommodate armor. The small premium in extra weight features more than carries itself. Perhaps the most insightful thing that I can relate about the Krew Pak is that after nine months of nearly daily use, I occasionally forget that I have it on. I've stopped in the middle of a trail near the beginning of a ride more than once thinking that I've forgotten to bring the pack, even though I'm actually wearing it. The KLIM Krew Pak is the largest capacity backpack in the KLIM lineup (9" x 14" x 20"). It has a removable tool pouch which turns out to be an unexpectedly useful feature. There is a fleece-lined goggle pocket on the outside of the main compartment and another, smaller fleece-lined pouch in one of the shoulders to insulate the hydration system hose in cold weather. The back panel is constructed in a manner that minimizes sweat. All of the straps, including the sternum and hip straps, are well-positioned and comfortable. The hydration bladder and bite valve are of thoughtful design with a capacity of three liters. The Krew Pak very comfortable to wear, fully-loaded or not, and the manner in which it moves with your body to keep its load in place is exemplary. I have used nearly type of backpack imaginable. For riding dirt bikes, the KLIM Krew is, hands down, my favorite. Ride and forget comfort. Another item of apparel that we consider indispensable is the KLIM Stowaway Jacket. The Stowaway is a lightweight, waterproof, breathable shell that is constructed from layers of Gore Tex® and ripstop nylon. It's lined, and has a micro fleece collar that is very functional, and is vented as well. The Stowaway packs into a very compact size for storage. The Stowaway is a 30-second solution to extreme conditions. Put it on over a Dakar Pro or Mojave Pro Jersey and you are ready to ride after dark or in cooler weather. We've even used the Stowaway hood under an F4 helmet as a substitute for the Windstopper liner. We are big fans of under the jersey style body armor suits. Though we have mixed feelings about the Leatt Adventure Body Protector (due to manufacturing issues), we've come to rely on it for protection. We have no reservations about the Leatt GPX Trail neck brace. The GPX Trail is a lower-profile and lighter version of the standard Leatt MX brace that allows a little more unrestricted head movement. It is an outstanding product, the best neck brace I've ever used. It's another item that quickly becomes transparent in use and, in terms of safety, may actually be completely indispensable one day. Leatt Dual Axis Knee Guards are fabulously light, very well-ventilated, protective and, at less than $100, a bona fide bargain. These are perhaps the best knee guards in their price range ever designed. Ours came with straps that were initially way too small, but stretched over time to provide a reasonable fit. For on-the-bike storage there is simply no substitute for the Giant Loop Mojavi. These bags are roomy, exceptionally well-designed and unbelievably rugged. Like all GL products, the Mojavi is bulletproof. We'll make this very simple - there really isn't another bag in it's class worth considering. 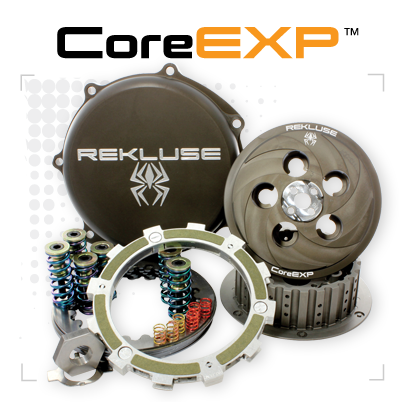 Though not an accessory, per se, we have sung the praises of the Rekluse Core EXP auto-clutch since we first bolted one on. It simply transforms a bike. Want to ride better? Get a Rekluse. We also recommend the Rekluse Left Hand Rear Brake, an item that is well worth the money that it costs. If you already have a Rekluse clutch, the LHRB is essential for those moments when you kill the engine on a steep uphill and the clutch freewheels. It is great for tackling steep switchbacks on the pegs since you can brake and maintain proper body position without having to search for the rear brake with your boot. Gaerne SG12 boots are simply my favorite offroad boots - ever. I will happily wear these boots, or their descendants, the rest of my riding days. 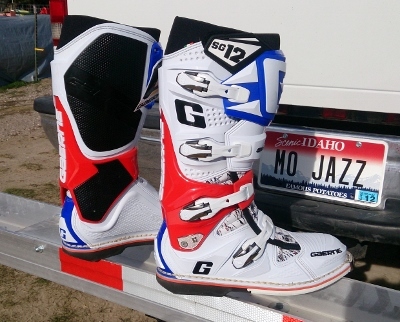 I could go on about the ARCONOS gaiter, the alloy buckles, the dual pivot system, the thermoplastic shin plate, the grip guards, the heel and toe cups, etc.,but I'll let Gaerne do that for themselves. The SG12's are the best motorcycle boots I've worn and perhaps the best heavy duty boots I've ever worn for any purpose. SG12's remind me of a set of good mountaineering boots - ones that fit just right. You are as protected as you need to be, but you can get them on and off easily, and live in them all day long. During this year's King of the Motos, I actually found my SG12's to be better hiking boots than the lightweight hikers that I'd brought along specifically for that purpose. The Trail Tech Voyager defines indispensable. Rarely have we been so completely blown away by a product. 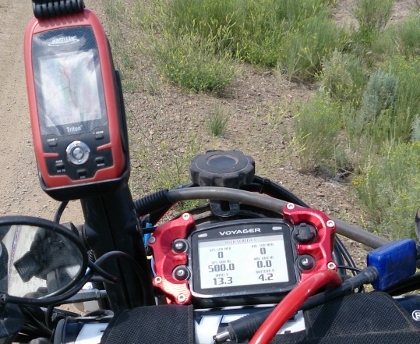 The Voyager is the most useful instrument of it's type we've ever used on a motorcycle. The sheer amount of information available through easy to access displays: speed (two ways), engine RPM, coolant temperature, GPS track, to list just a small sample, is incredible. Data logging capabilities are equally impressive, and getting data in and out of the unit could not be more simple. The display automatically adjusts to a variety of lighting conditions (or lack thereof). We have never encountered lighting in which the display was unreadable. You may not have heard of EKS Brand goggles yet, but we are betting that you will, and soon. "X" brand are the best goggles we've every worn, bar none. The frames are well-shaped, pliable and comfortable to wear. The optics are incredibly clear and durable. 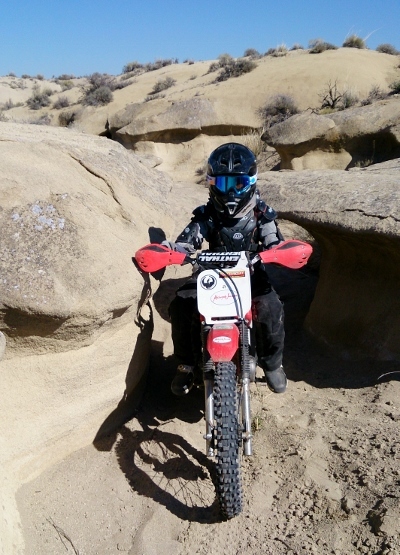 They fit in with the KLIM F4 helmet like they were made for it. Do yourself a favor and order up a pair of these right now. They are that good. Last, but certainly not least, we never venture out into the wild without our SPOT Connect. We've used every iteration of the SPOT beacon. The Connect is currently the best. We've heard of users having problems getting their smartphone to connect or sync with the Connect. Our experience is quite the opposite. We've used our Connect with a variety of Android-based smartphones and had no issues that could not be solved with a simple re-boot of the phone (and few of those). The SPOT Connect has bailed us out of jams more than once. If ever there were an item that merited a don't leave home without it, the SPOT beacon would be it. That's it for now. In the future we'll address bike parts and modifications that we've found to perform in a particularly meritorious manner.